Beautiful and winsome, Betsy Zook never questioned her family’s rigid expectations, nor those of devoted Hans—but then she never had to. Not until the night she’s taken captive in a surprise Indian raid. Facing brutality and hardship, Betsy finds herself torn between her pious upbringing and the feelings she’s developing for a native man who encourages her to see God in all circumstances. Greatly anguished by Betsy’s captivity, Hans turns to Tessa Bauer for comfort. She responds eagerly, overlooking troubling signs of Hans’s hunger for revenge. But if Betsy is ever restored to the Amish, will things between Hans and Tessa have gone too far? Inspired by true events, this deeply layered novel gives a glimpse into the tumultuous days of prerevolutionary Pennsylvania through the eyes of two young, determined, and faith-filled women. Suzanne Woods Fisher is an award-winning, bestselling author of more than two dozen novels, including Anna’s Crossing and The Newcomer in the Amish Beginnings series, The Bishop’s Family series, and The Inn at Eagle Hill series, as well as nonfiction books about the Amish, including Amish Peace and The Heart of the Amish. She lives in California. Learn more at www.suzannewoodsfisher.com and follow Suzanne on Twitter @suzannewfisher. 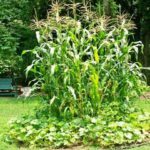 The Three Sisters’ Garden: Corn, Squash & Beans! Corn was a new food to the immigrants to the New World, introduced to them by Native Americans. Soon, it became an essential part of their daily diet, in one form or another. Growing it brought yet another new discovery: companion planting in the form of the Three Sisters’ Garden. 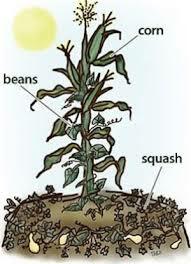 According to Iroquois legend, corn, squash and beans were three inseparable sisters who only grew and thrived together. 18th century Native Americans wouldn’t have understood the science behind why companion planting worked, but they knew it did. Beans, like all legumes, have bacteria living on their roots that help them absorb nitrogen from the air and convert it to a form that plants can use. Corn, which requires a lot of nitrogen to grow, benefits from the legumes and provides a pole support for the beans to climb. Low growing squash leaves shade the soil and prevent weed growth. Their sharp and prickly leaves deter pests. This tradition, of planting corn, beans and squash in the same mounds, became a sustainable system to provide long-term soil fertility among Native American tribes that farmed. The wisdom of planting Three Sisters’ Garden was adopted by the immigrants, including our own Betsy Zook from The Return. Betsy learned of the technique while a captive among a tribe of Indians and later, after she had been returned to the Amish, shared her knowledge with Anna and Bairn. Have you ever considered growing a Three Sisters’ garden? All you need is the right kind of seeds, a mound of dirt in a sunny spot, and to not forget to water. Mother Nature will do the rest. 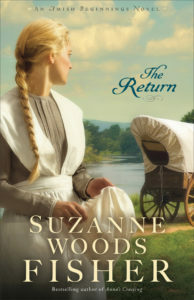 Suzanne Woods Fisher is a bestselling, award-winning author of novels about the Old Order Amish. Her interest in the Plain People began with her grandfather, who was raised as a Dunkard (German Baptist) on a farm in Pennsylvania. 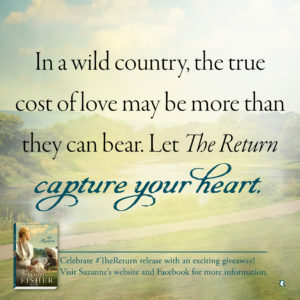 Suzanne loves to connect with readers! You can find her on-line at www.suzannewoodsfisher.com. 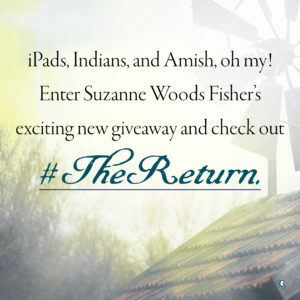 The Return is part three from Suzanne Woods Fisher's Amish Beginnings series. When historical fiction and Amish fiction collide, it makes a perfect read for me. The story is based on real events, making it an even more fascinating read. I loved the first two books of the series, Anna's Crossing and The Newcomer, and The Return is a perfect addition to the series. It is written so well, that I felt like I was transported back in time and living among the Amish settlers in Pennsylvania. I felt like I was right there experiencing the fear, struggles, and turmoil the community and kidnapped Betsy must have had gone through. There are several elements of the story I liked. Some mystery and suspense, lessons of forgiveness, redemption, faith, love, following your heart, and learning to turn to God to overcome tragedy. I highly recommend this book, especially for those who love Amish stories and those set during Colonial America. I, also, recommend to the reader to begin with Anna's Crossing, book one of the series.